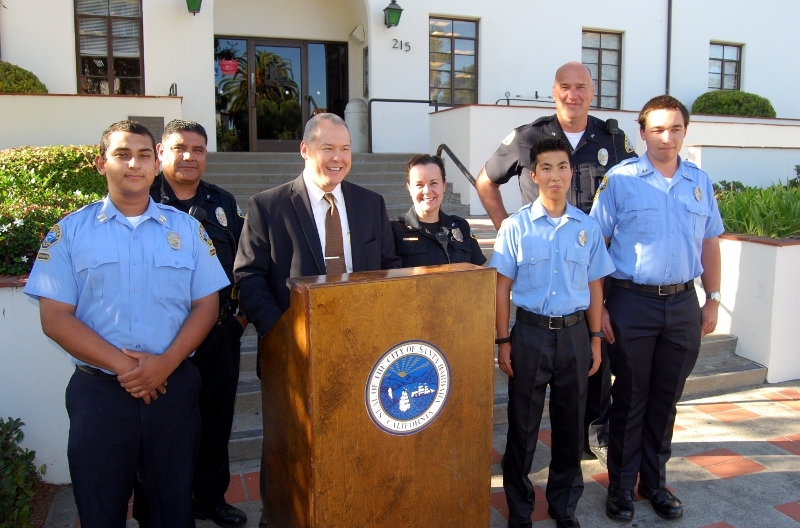 The Santa Barbara Police Department’s Explorer Program, which has struggled financially in recent years, hopes to come back to full strength this fall with a crop of new recruits. At an event Thursday night, the Explorer Program received 26 new applications, according to Sergeant Riley Harwood. The Explorers are a group of area youths between the ages of 14 and 20 interested in careers in law enforcement. They have weekly meetings and frequent training sessions where they learn police procedures, perform training exercises, and practice skills, even participating in ride-alongs with beat officers and playing underage decoys in sting operations. Currently, the Explorer Program has five members who have been in the program for varying numbers of years. Luis Gutierrez, the Explorer’s ranking officer, is a 20-year-old SBCC student working on his associate degree in criminal justice. Gutierrez said his dream is to work for the SBPD. Harwood said a flourishing Explorer Program, ideally with 15-20 young men and women, could help the department bolster its ranks with officers from the area, although he said the SBPD would not lower or compromise its demanding recruiting standards for the sake of hiring locally. The Explorer Program, an affiliate of Boys Scouts of America, is a fixture in many police departments nationwide. Harwood said the SBPD Explorers have been training and competing with larger programs in the Los Angeles and Las Vegas police departments, two groups the SBPD hopes to emulate with more participants. Larger programs sometimes offer as many as five different branches, including crime scene investigation and dispatch specialty training in addition to the general Explorer curriculum, which is often integrated into area high schools. And the program itself is no joke. Harwood said it’s “not an after-school daycare or diversion program. … The kids have to have an interest in this job.” Explorers are required to have completed eighth grade and maintain a 2.0 GPA and “high moral character” throughout high school. Riley Barrad, the Explorer’s youngest member at 15, said he joined a year ago in hope of eventually becoming a SWAT officer. Barrad said prospective Explorers need to be focused and committed to their future. “You need to have a goal and go into it with an open mind,” Barrad said. Harwood said the program requires a budget of between $5,000 to $10,000 per year. The next step for the 26 new applicants will be a written and physical test on November 3 at La Colina Junior High School.